ALOT has happened in the last two days. Please take a good look at this hard working crew of filmmakers below: Anni, Brannon, Taylor, Zaya, Hannah, Carol-Lynn, Caylene & Simon. Carol-Lynn has been working on an experimental documentary about addiction. For her stylistic approach, she is creating digitally drawn imagery as well as drawing on photographs. For her audio track she has combined a recorded interview with her own voice over. Besides working hard on her piece, she is also very good at keeping hydrated! Simon continues to polish his documentary titled 'Rez Ball'. He has been tweaking his timing and three audio interview tracks with precision. He has added & amended his title and credits and added sound effects. Today he also captured footage of a game of b-ball at lunch to add to his piece. Simon is also very good at being sure to get up from the computer, stretch and lift heavy things between his post production activities. Caylene, Brannon and Hannah continue to work on their animation starring gummy bears. This is an incredible team that has everything you need to create a great film: a director with a vision and message, a production co-ordinator with patience, quality control and stamina and a devoted technician who quickly understands and operates the software! This epic film has a large cast of voice actors, sound effects and high-tech special effects! Music and titling was added which further enhance the story. Only a few gummy bears where harmed...well....EATEN during the making of this film. Anni, Taylor and Zaya is a very busy filmmaking team and they have only just today sat down to concentrate on editing! 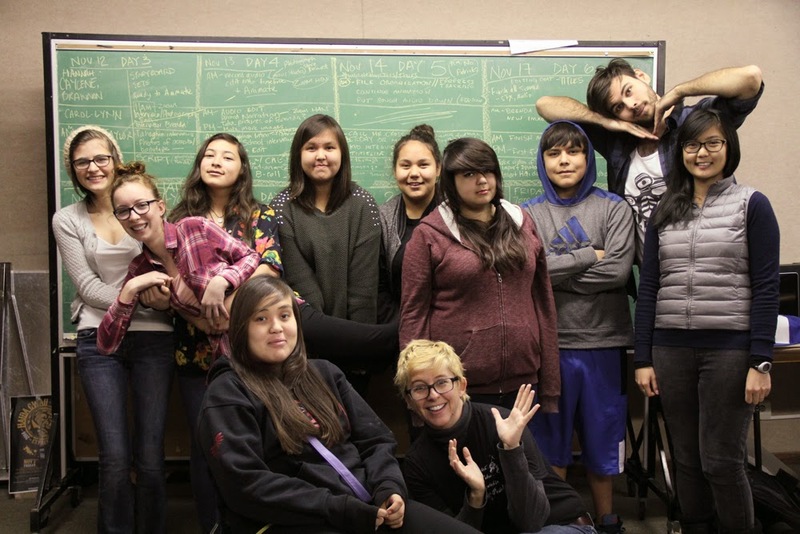 Their time thus far has been spent interviewing kids and adults all over Masset about their topic: Body Image. They have interviewed over 25 people in order to get a cross sections of opinions. This trio cut their 20 minute film down to 5 minutes by noon and then edited their opening sequence as well. These natural filmmakers edit by committee, all taking turns working the mouse AND have time to sing along to their ipods!